AirMagnet Spectrum XT is the second generation of spectrum analyzers to carry the AirMagnet name. The XT is a USB connected device whereas the previous model was a 32-bit CardBus version (OEM’d from Cognio). AirMagnet was gracious enough to host a session at the recent Wireless TechField Day event and we got to spend some quality time with the AirMagnet team discussing the WiFi Analyzer (protocol analyzer) and the Spectrum XT product. 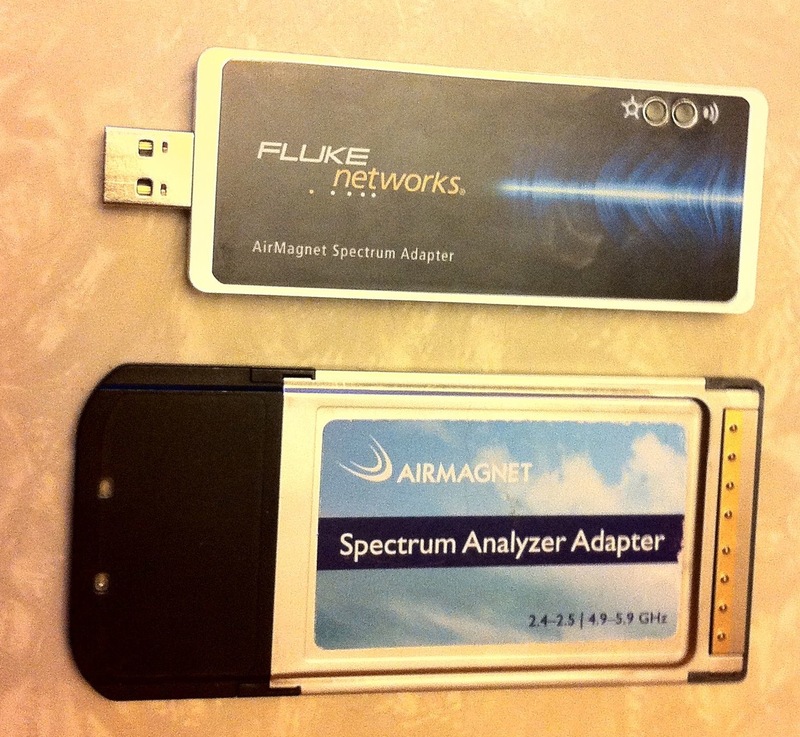 This being the second iteration of Spectrum Analyzers from AirMagnet, much of my opinions come from using the previous model which was OEM’s from Cognio. Cognio was acquired by Cisco and the old product was relabeled the Cisco Spectrum Expert. All 3 of the CardBus products (Cognio, AirMagnet, Cisco) share a similar (same) codebase and the new Spectrum XT product appears to be a rewrite from the ground up. This brings with it a new interface into the product including views such as the Spectrum Density view. This also brings some quirks for those of us that are familiar with (expecting) one or features from the old application. The USB form factor was easy to manipulate and a welcome change from the CardBus only solution that has forced many of us to resort to the cumbersome ExpressCard to CardBus adapters. 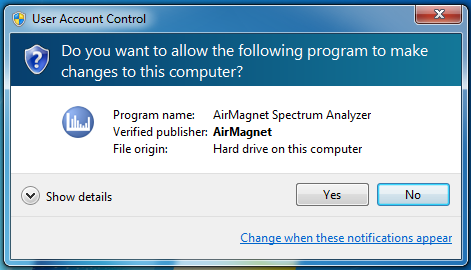 The AirMagnet dance of acquiring a license, User Access Control dialogue box, unsigned drivers and no ‘proper’ SSL cert on their My Airmagnet site aside, the installation was relatively straightforward on my Mac running Fusion and Windows 7. It should be noted that in this configuration, Spectrum XT has no direct access to the built in WiFi adapter on the Mac so you’ll either need to reboot into BootCamp or attach a supported USB wireless adapter to be able to pickup SSIDs. None of us like dealing with SSL certs, but seriously? UAC Errors are so Vista... I know you can work around them, but should you *have* to? The main interface of the application sports numerous easy-to-digest views including the new Spectrum Density view, a Real Time FFT with Avg, Max, and Max-Hold views, and the Spectrogram (historical waterfall) view. The less obvious components of the screen along the left side reveal some pretty important data being hidden such as the Duty Cycle listed per-channel and the Interferers and Devices pane. As you can see from my screenshot, I must be doing something wrong because there is a tab for Bluetooth devices and my Bluetooth device isn’t showing up there – it’s showing up in the Non-WiFi Interferer tab. Clearly there is at minimum some ambiguous terminology here that must be explored further – this didn’t seem to be the case with the Cognio card. Easy to read even if the Bluetooth is sorted wrong. The card is a touch on the wide side so if you have USB ports that are close together, you’ll want to use the included USB extension cable or a 3rd party USB hub. 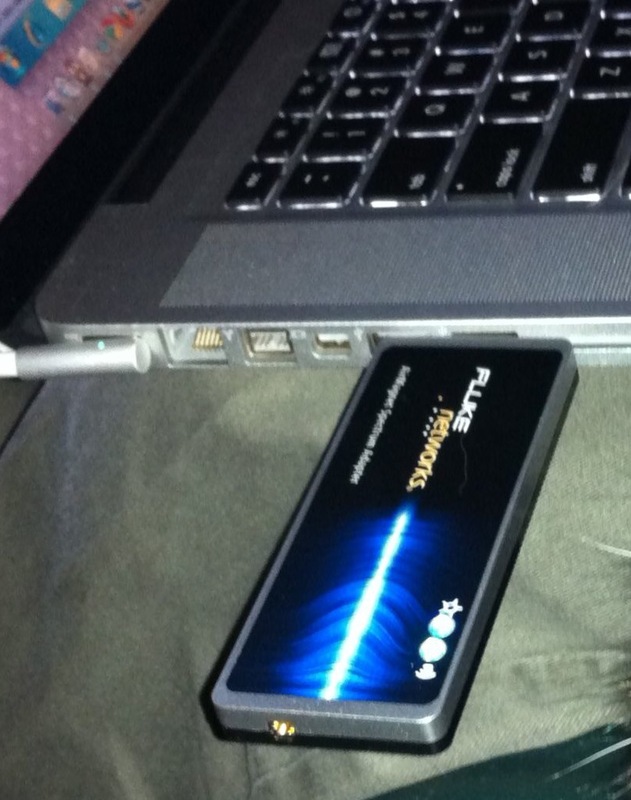 If you’ve got a Mac setup, it should be noted that with a USB hub, you can easily attach a supported wireless adapter and have a fully functioning product running within a VM. The addition of SNMP integration makes this application easy to plug into monitoring systems to to trap out to. A nice addition for those of us looking to leave something in the field at a remote location for a few days to ‘watch the air’. Integration with the AirMagnet Survey pro application rounds out the major feature list. Those of us that survey using AirMagnet products, this is a must have for Spectrum integration during surveys. There is a short list of conspicuously missing features that reveal the somewhat young state of the application – especially if you know and love the CardBus products. Those are exporting your interference devices list and the ability to modify your views to the n-th degree. Expect a slight learning curve for those new to the product. The XT product appears to only allow a max of four displays whereas the legacy product would allow for as many as could fit your screen (I typically used 6 depending on the environment). These outstanding seemingly cosmetic issues I expect will be fixed eventually, but do make sure your support contracts are up to date – AirMagnet can be especially finicky about version releases and they appear to have moved to the traditional AirMagnet licensing scheme (a la Survey Pro and WiFi Analyzer) and away from ‘the card is the license’ that the last product used. Those of us that travel with every tool installer handy (for those sans-Internet times), make sure you download an extra copy of your .lic file and keep it with the app! In all, the Spectrum XT is a great spectrum analyzer with a slightly different application from the previous model. This means that it’s not going to be a drop-in replacement for those of you looking to move off of the CardBus model – especially if you export identified devices for inclusion into your site-survey report. I’m hoping that these features come soon (I’ve provided this feedback to AirMagnet) and when these and a few of the other last few software tatters get cleaned up, I expect this to become the defacto enterprise-grade survey product. Editors note: After contact with AirMagnet, the ‘device export’ function is apparently being addressed and should be available in an upcoming patch. Full disclosure: I was a delegate for the first ever Wireless Tech Field Day event organized by Stephen Foskett and GestaltIT This event was sponsored by Meta-Geek as well as other presenters including payment of accommodations for all delegates. Evaluation product was distributed to delegates for hands-on exposure for this review without promise or commitment to provide any feedback, positive or negative. Professionally, I work for a VAR which provides services for industry leading technology manufacturers. The views expressed on this blog are my personal opinion and do not necessarily reflect opinions my employer. MetaGeek’s Wi-Spy DBx is a small form factor spectrum analyzer which gives you visibility into the 2.4 and 5GHz spectrums allowing you to readily identify sources of interference that may be present. I was fortunate enough to spend some time with Ryan Woodings and Trent Cutler from MetaGeek while at the Wireless Tech Field day recently and they gave us the grand tour of their product lineup – hardware and software! Those of you familiar with WiFi technologies (802.11a/b/g/n) know that the frequencies they run in are unlicensed by regulatory bodies (here in the US, that means the FCC). This means that anyone can do anything there and they commonly do! People running non-WiFi devices in the 2.4 and 5GHz spaces can often cause interference for wireless networks causing poor performance, intermittent connectivity, or outright failures of wireless networks – especially in the very crowded 2.4Ghz range. Moving beyond the insight provided by such tools as inSSIDer which can only tell you about WiFi specific data, the Wi-Spy DBx allows you to visualize and identify non-wifi signals such as bluetooth devices, microwave ovens, analog video cameras, and other such obnoxious or potentially damaging signals. MetaGeek offers a few devices and knowing what you’re looking for in what frequencies is important to selecting the right one. The Wi-Spy 900 is targeted at those looking for devices in the 900MHz range which is not useful to those of us living in the WiFi space (2.4 and 5GHz). Most readers won’t be interested in this but it’s included for completeness. The other three devices that are relevant to our WiFi space are the WiSpy 2.4i, WiSpy 2.4x and the WiSpy DBx. The two 2.4 units are fixed frequency (2.4GHz only). The 2.4i model comes with integrated antennas and the 2.4x comes with a detachable antenna (more on this feature shortly). Both of these units are appropriate for people looking at devices that only support 802.11b/g/n(2.4). The WiSpy DBx allows us to look into the same 2.4GHz spectrum as the i/x models, but also includes visibility into the 5GHz range for those of us looking at 802.11a/b/g/n across the board. With the prevalence of 802.11a devices in many ‘business grade’ laptops and with many 802.11n deices supporting the cleaner 5Ghz frequency, the DBx allows us much greater flexibility and insight into those spaces. Being a very small USB-connected device, it’s about the size of 2 AA batteries, includes an external RP-SMA connector, and a dipole antenna for instant ‘out of the box’ usability. The RP-SMA connector and antenna configuration allows you to remove the included antenna and attach an optional directional ‘device finder’ antenna. The intention here is that if you’re trying to track down an obnoxious source of interference, you can use the external panel antenna to sweep back and forth in an area to see where the signal gets stronger or weaker. Using this method, you can get much closer to ferreting out anything that avails you! MetaGeek offers 4 main applications for using their WiSpy devices, the main Chanalyzer application, and Lite, Pro, and Lab versions allowing for a diverse lineup for most any need. The Lite application is for the 2.4i hardware and is otherwise not a part of this review. The main Chanalyzer application is currently at version 4 and is included with the 2.4x and DBx hardware. The bundled application gives you a jumping off point for getting started with spectrum analysis and gives you the familiar ‘squiggly line’ interface as well as some pretty nice approaches to displaying data. The Max/Min and Current display views give you a one-stop glance and utilization in your spectrum for easy to digest and understand information. 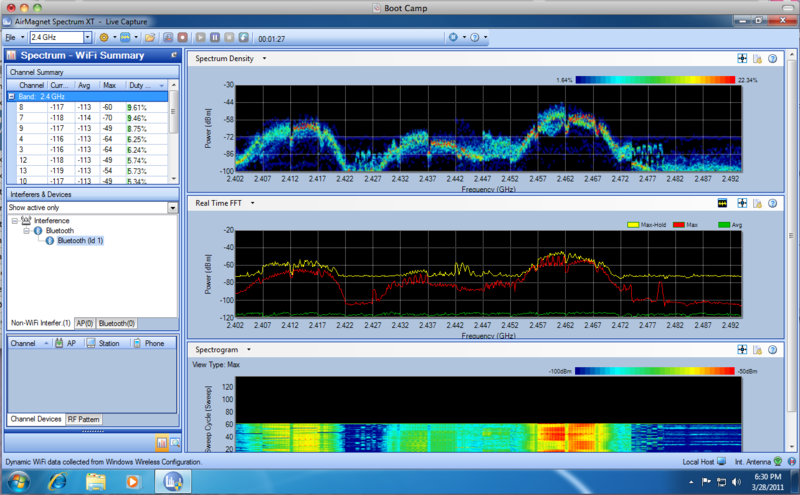 Chanalyzer also gives you the ability to record data for future review (or submittal back to MetaGeek!) is a feature that allows you to take a snapshot of where you’re at and review it later offline or take it to a friend that may be more fluent in spectrum analysis. With a database of silhouettes to overlay ontop of your view, you basically mix and match patterns of what is live in your environment against known or common interferes. This gives you a pretty straightforward way to identify the type of devices you’re looking for so you can narrow down if you should be hunting high for video cameras or low for microwaves. The Chanalyzer Pro application gives you richer insight into your environment with the addition of a waterfall view along the left pane of the application. You use this to navigate through time as a running tally over the length of a capture. The addition of the new duty cycle view gives you a straightforward view of ‘consumed airspace’ and several other features such as device finding (recommend using the device finder antenna attachment for this!) as well as a very flexible report builder round out this application for those looking to ‘step up’ from the default Chanalyzer application. At $499, those looking to start offering ‘commercial grade’ reports and services to customers, this is right up your alley. As an additional incentive, MetaGeek offers a $99 savings when purchased with the DBx hardware so if you’re thinking this is where you’re going to end up, and you can stomach the extra $300, keep that in mind. Those of you looking for the geek-out application will be interested to know that MetaGeek is also offering Chanalyzer Lab which allows you to fidget with the hardware knobs inside the analyzer hardware. This application isn’t for everyone but is indispensable for those looking for much more granularity into frequency and amplitude data. MetaGeek has made this application quite affordable at $99 so those of you looking for an environment rich in tweaking and tuning, or if you’re simply more interested in how RF works and want to dig deeper into frequency analysis, this application is compatible with the 900x, 2.4x and DBx hardware. All three applications I tested (Chanalyzer, Pro, and Lab) required no obnoxious considerations and were very straightforward to install. There were no special drivers required on my Windows 7 VM running in Fusion on a MacBook Pro. In this configuration, the Windows OS has no direct access to the wireless card in my MacBook so I was unable to retrieve local WiFi data while using the product. Those using BootCamp to natively run Windows on your MacBook shouldn’t run into this problem but us Fusion/Parallels users are out of luck on this particular featureset until we get an OS X native version of the Chanalyzer applications. Those familiar with auto-device classification found in higher end PC based spectrum analyzers will find this particular feature missing from the Chanalyzer lineup. This ability to ‘set it and forget it’ to gather a running tally of interferes is one of the most significant features missing from an otherwise fairly complete product lineup. Given that these other analyzers typically range into the $2-3k+ range, it’s entirely plausible to find compromise for users looking for spectrum analyzers and can be flexible with their requirements. In all, the DBx is an excellent product for the vast majority of those people looking to get data about their 2.4 and 5GHz spectrums. The flexible application approach give users the ability to make a minor investment upfront in the hardware and grow as they can justify it. While the Wi-Spy may not be appropriate for those few outstanding enterprise environments that require additional integration or those looking to automatically classify sources of interference, it is a perfect tool for those environments that don’t have newer infrastructure devices that can give them insight into their spectrum but don’t want to break the bank on some of the ‘big-boy’ analyzers. The folks at MetaGeek have done a graceful job of putting some very powerful tools well within the reach of those that are looking to jump into the wireless game or are looking to augment their personal toolkit with gear that does something that would otherwise be unavailable to them. MetaGeek can be found here. GestaltIT can be found here. Full disclosure: I was a delegate for the first ever Wireless Tech Field Day event organized by Stephen Foskett and GestaltIT This event was sponsored by Meta-Geek as well as other presenters including payment of accommodations for all delegates. Evaluation product was distributed to delegates for hands-on exposure for this review. Professionally, I work for a VAR which provides services for industry leading technology manufacturers. The views expressed on this blog are my personal opinion and do not necessarily reflect opinions my employer.